We’ve come to volume three in Keith Moray’s Torquil McKinnon semi-cozy police procedural series, set on the fictional island of West Uist in the Hebrides. I find the books unchallenging, but entertaining. Inspector McKinnon, motorcycle rider and champion piper, has had tragedies in his life, but overall he’s cheerful and optimistic, as are his colleagues. That makes a nice change in the mystery genre. 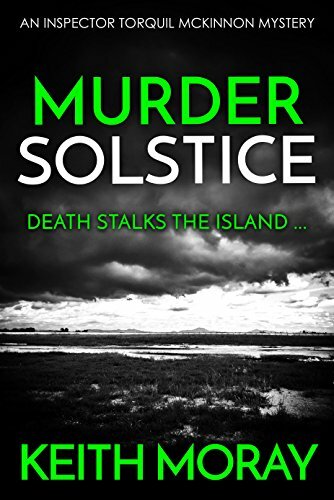 In Murder Solstice, the laird’s manor on West Uist, which has gone through three hands in as many books, is now home to a New Age cult group. The group anticipates some form of spiritual enlightenment in connection with being present at the Hoolish Stones, a local henge, during the spring solstice. They’ve attracted the attention of national television, but also of a local historian who is livid at their leader’s theories about the stones. Also suspicion is rising that some local farmers are running a dog-fighting operation. Meanwhile, the police force has been lumbered with a new officer, sent by a resentful and devious chief superintendant on the mainland. But she’s young and attractive, and Torquil possesses certain skills that may help win her over to his side. Murder Solstice won’t change your life, but it’s an interesting and engaging mystery novel. I enjoyed it. Cautions for mild sexual content and mature themes.